With all of the buzz surrounding the upcoming The Justice League movie (built up by all of the guest appearances in Batman v Superman: Dawn of Justice) and the continuing saga of The Avengers (fed by all of the new heroes in Captain America: Civil War), it’s easy to forget about the other superhero cash cow, the good old X-Men. 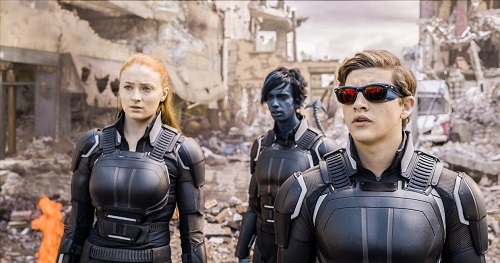 Well, they’ve got a new movie, too: X-Men: Apocalypse. Set in 1983, X-Men: Apocalypse sees the emergence of a global threat; an imposing ancient Egyptian immortal named Apocalypse (Oscar Isaac from Inside Llewyn Davis and Star Wars: The Force Awakens) has been awakened and, after seeing the state of the world, decides that he must cleanse it. He does need help, though, and his search for his “four horsemen” leads him to a quartet of disenfranchised mutants: Magneto (Michael Fassbender from Prometheus), Storm (Straight Outta Compton‘s Alexandra Shipp), Angel (Ben Hardy from “EastEnders”), and Psylocke (Deliver Us from Evil‘s Olivia Munn). To stop him, Professor Charles Xavier (James McAvoy from Victor Frankenstein) enlists the help of his own mutant squad that includes Mystique (Jennifer Lawrence from The Hunger Games), Beast (Mad Max: Fury Road‘s Nicholas Hoult), Jean Grey (Sophie Turner from “Game of Thrones”), Cyclops (Joe‘s Tye Sheridan), and Nightcrawler (Kodi Smit-McPhee from Dawn of the Planet of the Apes). It’s a mutant-on-mutant battle, with the fate of the entire world at stake. Director Bryan Singer, who has done many of the other X-Men movies as well as classics as varied as The Usual Suspects and Jack the Giant Slayer, is again in the chair for X-Men: Apocalypse. The screenplay was written by Simon Kinberg (Sherlock Holmes) from a story that he and Singer cooked up with help from Michael Dougherty and Dan Harris (the duo who also wrote Superman Returns with Singer). The thin narrative is basically just an excuse for a long string of heart-pounding action scenes, but isn’t that the point of a popcorn movie? Essentially, the movie is just the right combination of story and action; there’s plenty of fierce combat and wanton destruction, all unhampered by an overly complicated plotline. X-Men: Apocalypse is set after X-Men: First Class and X-Men: Days of Future Past but before the events of the early-aughts X-Men movies. It features the younger versions of the mutants who are still discovering and harnessing their powers, so they aren’t quite the crack team of superheroes that they would become in their later years. One of the most fascinating aspects of the X-Men characters is the fluidity of the morality; best friends like Professor X and Magneto can become enemies, both believing that they have the best interests of their fellow mutants in mind. This grey area between good and evil is on full display in X-Men: Apocalypse, with the alliances shifting and morphing as quickly as they develop and form. Now is as good a time as any to admit to you readers that, until X-Men: Apocalypse, I had not seen an X-Men movie since X-2: X-Men United in 2003. I read the comics as a kid in the eighties, so I was familiar with the characters, but as far as what has happened in the movies up until this point, I was at a loss going in. Luckily for me, X-Men: Apocalypse doesn’t rely on the other movies too much, which may be redundant for huge fans, but it’s pretty convenient for us casuals. So, what X-Men: Apocalypse has to offer viewers is a simple point A-to-point B story that is motivated by a lot of mutant fighting. In short, it’s a good superhero movie, so fans of superhero movies won’t be disappointed. And neither will their non-fan friends who get dragged along to the theater with them. Like all modern superhero movies, X-Men: Apocalypse is full of special effects. Some of the effects are practical makeup effects, but, just as one would expect from a movie in which a woman who controls the weather throws lightning bolts at a guy who shoots beams of energy from his eyes, the lion’s share of the visuals are computer generated. The effects were chiefly designed by John Dykstra, who has done effects for everything from Star Wars and Lifeforce to Godzilla and The Hateful Eight, and unfortunately, they look the same as just about every superhero movie out there. The most remarkable effect sequence is one that involves the mutant Quicksilver (Evan Peters from “American Horror Story”) and his super speed, which is represented visually by him moving around a frozen-time scene. It’s impressive, but again, it’s been done before. Also like all modern superhero movies (and modern action movies in general), X-Men: Apocalypse is offered in both 3D and 2D. Aside from an opening credits sequence that takes the viewer on a 3D journey through the history of man, the 3D is barely discernable. It’s a gimmick, and completely unnecessary. It’s safe to skip the 3D for this one. X-Men: Apocalypse is packed with well-choreographed and perfectly executed fight scenes. The big highlight is a cage fight between Angel and Nightcrawler (who is probably the coolest character in the movie), with Angel swooping and sliding like a winged MMA fighter and Nightcrawler teleporting around trying to stay a step ahead of him. Another highlight is a special cameo from Wolverine (of course, played by Hugh Jackman from The Wolverine) in a scene that would be spoiled by giving away too much about it, but just let it be known that it’s a crazy sequence. 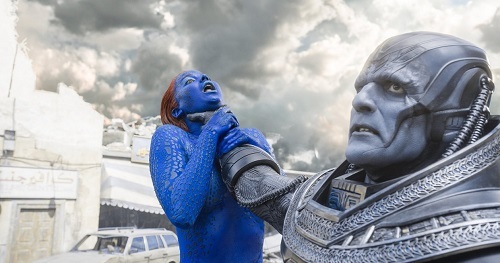 The action in X-Men: Apocalypse comes fast and furious, and both the stunt work and the CG enhancements are thrilling.